A compact, athletically built linebacker with a strong looking frame who possesses an impressive initial burst to his game when asked to close on the football. Looks natural in space, is quick to re-direct and possesses the closing speed to consistently make plays off his frame. For the most part takes good angles in pursuit vs. the run game and breaks down well when running the alley. He generates good natural power into contact, plays low, exhibits a snap through the hips and will run his legs and wrap on contact. He will run himself out of plays in space sometimes and at times plays a bit out of control, but for the most part is a solid tackler. Exhibits better instincts and read-and-react skills than given credit for. He does a nice job of quickly locating the football, doesn’t bite on a ton of play fakes and is quick to diagnose the play. At times he will seal himself away from the action inside the box, but for the most part I was impressed with his natural feel of the game. He needs to do a better job using his hands and extending his arms in order to take on blocks inside, but he looks natural and sudden running around blocks and keeping himself clean. However, he too often leads with his shoulder at the point of attack and, despite his natural power, he doesn’t shed blocks well inside and can be easily sealed from the action. Looks natural in coverage. He’s quick footed, fluid in the hips and is consistently able to re-direct and explode out of his breaks. At times gets a bit overextended with his hips working in his drop but he collects himself quickly, displays natural balance and exhibits the closing speed to still make plays on the football. He looks natural in zone coverage, keeps his head on a swivel and covers a lot of ground in space. Gets a bit impatient in man coverage, he likes to be physical, and will lose balance into contact trying to create a bump for himself when asked to re-direct. Also, is a bit slow to locate the throw when asked to turn and run vertically. However, he possesses the balance and fluidity that makes him tough to separate from and even if he does give up a step, possesses the second gear to quickly close. Displays the athleticism to hold his own in space in the NFL over the slot and in man coverage vs. NFL caliber running backs. Impression: A run and hit guy with impressive athleticism and range. Possesses solid instincts and is a better read-and-react linebacker than given credit for, but still not elite in that area. Nevertheless, looks like a starting caliber 43 weak side guy who would be ideal in a cover two scheme. • The first thing you notice about Brown is his first step. It’s hard to justify saying any other college linebacker has a better first step. • Has track speed, which is unique for a linebacker prospect. He can play up to reported 10.6 100-yard dash time. There are few ball carriers who can run away from Brown. • Is not the most physical defender and can get overmatched more than he should. If Brown wants to survive in the NFL, he has to get stronger. • Remains active when he’s dropped back in zone, especially when routes are developing behind him. • North Carolina has used Brown over the slot receiver, especially if its a tight end. • Brown has hands that would be considered good if he played safety. As it is, they’re excellent for a linebacker. It’s not necessarily his interception total, but his ability to make a play on the ball. • You can tell by Browns measurements alone that he needs to get bigger to make it at the next level. His frame has good definition, but needs to get bulkier throughout. • Was only a spot starter in 2010, mostly because Quan Sturdivant and Bruce Carter were on the team. 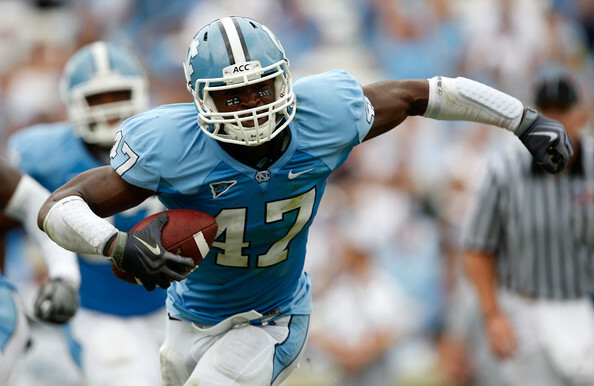 While the suspended players on North Carolina’s 2010 defense garnered most of the headlines, Brown emerged from a host of backups to be the leader of the bunch. The linebacker had been overshadowed by star players like Bruce Carter and Quan Sturdivant, but he made a name for himself by finishing second on the team with 72 tackles despite starting only five games. Now as a senior in 2011, Brown–through eight games–is tops on the squad in total tackles (53), solo tackles (32), tackles for loss (seven) and sacks (4.5). Brown is an incredibly athletic Will linebacking prospect. Needs to add bulk. Can cover wideouts, backs, tight ends, you name it. I would think that tight ends could be really physical with him at the line, and the taller guys, the 6-6 guys, might have their way. Brown, almost, would be better as a safety because of his speed. Blockers are going to take him on and win, most of the time. He’s going to be awesome on special teams, because his size/speed ratio is just awesome. Is his lack of bulk going to hurt him? Or will he be used in a way that can protect him up front and allow him to run and chase? If its the latter, then I think he will be successful. If you’re going to ask him to take on blockers and shed them, it won’t work. Can he get stronger without losing the speed? Big questions surrounding Brown. On talent, late first round pick. Should be available at 32. He won’t start right away, but we all know the Giants have struggled with covering tight ends and backs down the field. Brown could solve that. Looks like another Bruce Carter. NC loves there small fast LBs. 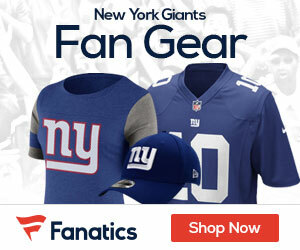 I dont think the Giants need anymore weakside type guys. They have Boley and Williams. I think they might go for a LB late like always and see if the guys they have can get it done. With Boley and Williams on the weak side and Jones, Blackburn, Herzlich and maybe Goff in the middle, seems like they will be looking for a strong because Kiwi is the only one there now. Unless they move Herzlich there. Looks like he could fill the hybrid position that Deon Grant has been playing, big enough to cover TE’s and fast enough to cover slot WR’s.